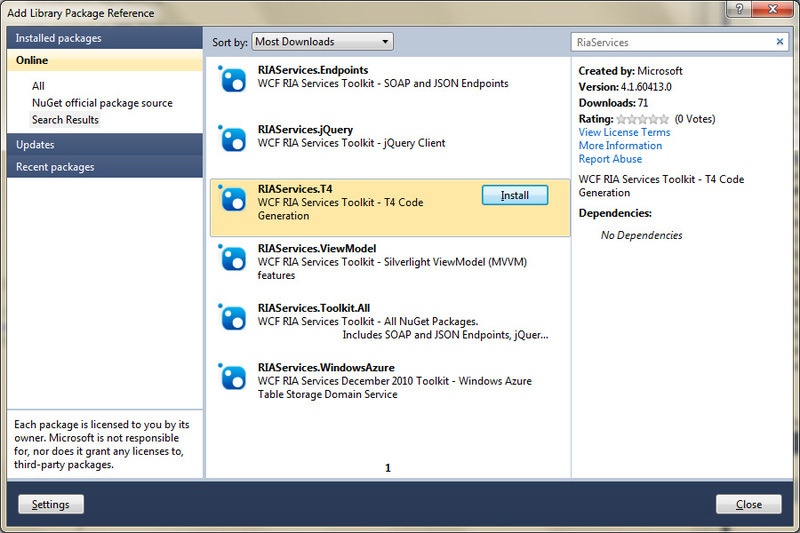 In March of this year SP1 of WCF RIA Services was released together with SP1 of Visual Studio 2010. Soon this was followed by a new version of the WCF RIA Services Toolkit. Microsoft has changed a few things in SP1 which makes it possible for you to implement you own code generation classes that can manipulate the client code generation of RIA Services entities, contexts, ... In my opinion this is a great new feature which is very powerful when you are building your own Silverlight framework. There is not much information about these features available on the internet yet. The most interesting source is the blog of Varun Puranik, one of the Microsoft developers of WCF RIA Services. So in this article I will describe how the code generation in RIA services SP1 works and I will demonstrate some scenarios and ideas were customizing the generated code is a nice technique to extend your own framework. I will try to focus on the code generation aspects so views and viewmodels, dynamic loading of modules, ... will not be handled in these examples. I'm using RIA Services since the first betas because it is a powerful framework which generates a lot of Silverlight client code for you. When you have implemented entities, DTO's and domain services on the server side an MSBuild task will automatically generate client proxies each time you build your project. RIA Services can also copy validation or other logic from the service side to the client. For each DomainService a client side DomainContext will be created and these DomainContexts will load your entities and DTO's and they support change tracking and submitting changes. I created a simple Silverlight Navigation Application with an ASP.NET project . 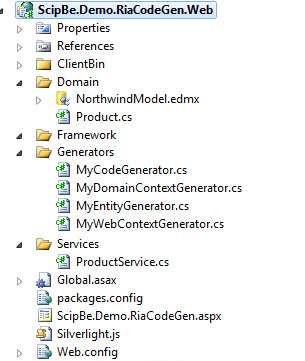 At server side I created a folder called Domain with an Entity Framework Model that includes some entities of the Northwind database. The Silverlight project has a WCF RIA Services link to the server side ASP.NET project which hosts the DomainServices. When you build the solution the code geneneration will be executed. In the hidden folder Generated_Code in the Silverlight project you will find following default generated client code. For more information about RIA Services you can read the documentation at MSDN. Now we can start modifying this project. First of all we have to install the WCF RIA Services Toolkit (April 2011). You can download the installation package from the Microsoft website. 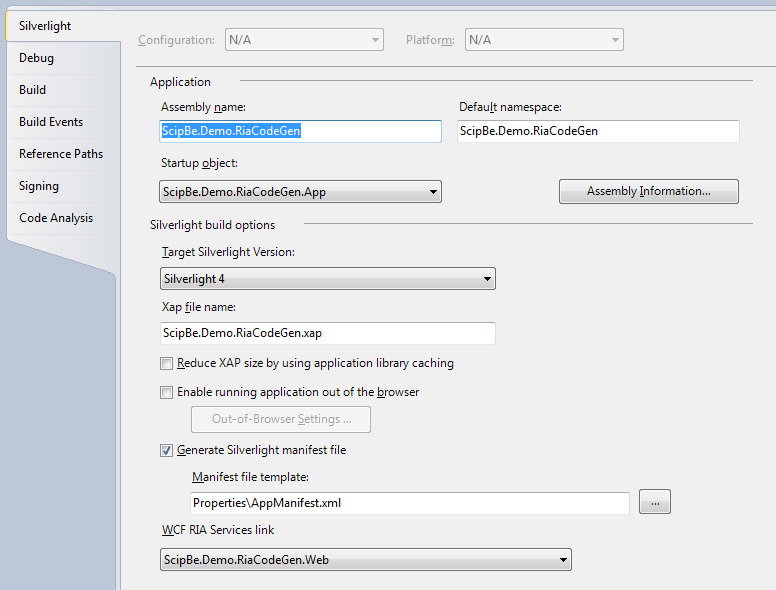 Another and easier way is to open the new package manager NuGet which is available after installing Visual Studio SP1. Choose Get Library Package Reference and look for RiaServices in the online gallery. Then install the RIAServices.T4 library. Since the April update of the Toolkit you do not need to modify the Silverlight project file anymore. Before this release it was required to add the <RiaClientCodeGeneratorName> tag in the project file. 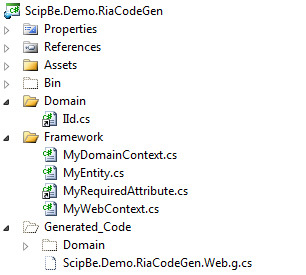 The CSharpClientCodeGenerator class and the DomainServiceClientCodeGenerator attribute are the main components that hook into the extensibility features of the WCF RIA Services code generation process. Each of the 5 code generators have protected virtual methods which you can override to change the code generation of a specific part of a class (class declaration, constructor, property, ...). And finally there is a TransformText method which contains all the generated code. So in my server project I added a Generators folder with a MyCodeGenerator class derived from CSharpClientCodeGenerator and decorated with the DomainServiceClientCodeGenerator attribute. I also created 3 other generator classes for the entity, domain context and web context. 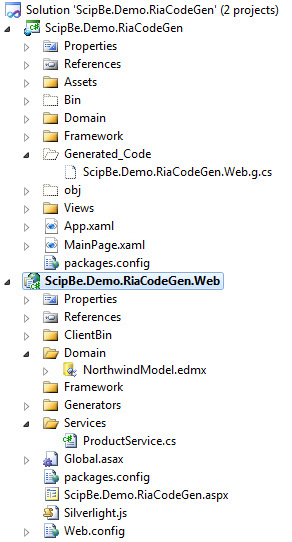 If you build your project again you will see that the generated code (ScipBe.Demo.RiaCodeGen.Web.g.cs) will be different from the default code generation. The functionality is the same but the order of the classes differs and comment headers are not generated. Let us start manipulating the default code generation behaviour. Wouldn't it be handy if you could use the same interfaces for your entities at server and client side? With just a few lines of code we can accomplish this. First I created an IId interface with an int Id property. 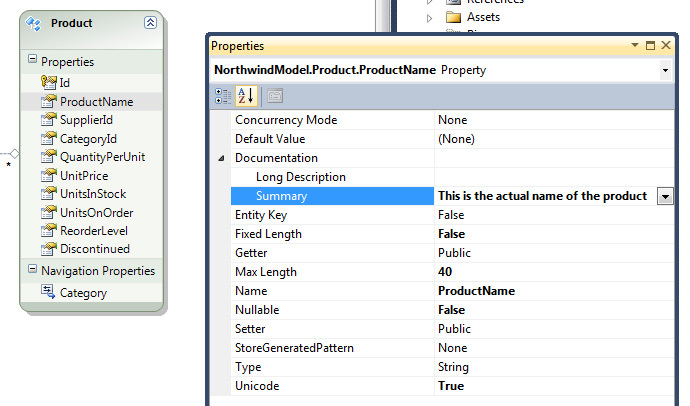 I renamed the key properties in my Northwind EDM and I added the IId interface in the partial class of each entity. Because the interface is also needed on client side I created a shared link to this file in the Domain folder in my Silverlight project. In the MyEntityGenerator class I implemented the GenerateClassDeclaration method and there I added a using to the namespace of the IId interface. Finally in the TransformText method I check if the entity is derived from IId and then this interface is added in the generated code by replacing strings. The same approach can be used to decorate the generated client entities with attributes. I like to use the DebuggerVisualizer attribute which makes it easier to inspect collection of entities in the Local and Watch windows of Visual Studio. So on server side I decorated the Product class with the DebuggerDisplay attribute. In the TransformText method in the MyEntityGenerator class I added some code to check if the class is decorated with the attribute and then I replace some of the generated code. Don't forget to add the using of System.Diagnostics. When debugging the Silverlight project you will be able to see the names of the products in Visual Studio Locals, Watches and tooltip windows. 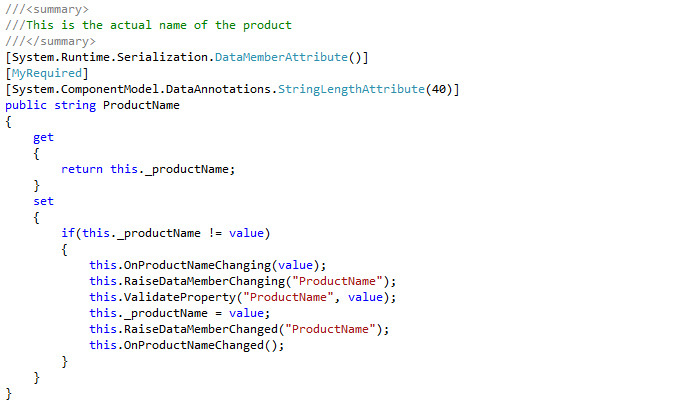 The Entity Framework and RIA Services support several data annotation attributes like Required, StringLength, RegularExpression, Range, ... You can add these attributes in your own metadata classes but RIA Services also adds them automatically for constraints which are defined on the database. By modifying the generated code you can implement your own derived attributes. I also found a nice example of an implementation of the T4 Code Generators at the blog of Yavor Georgiev who is a Program Manager at Microsoft. He describes how you can copy the XML comment of the classes and properties of EDM entities. I tried to improve his sources a little bit and moved the logic to a XmlCommentsProvider class. Now I can call the XmlCommentsProvider. 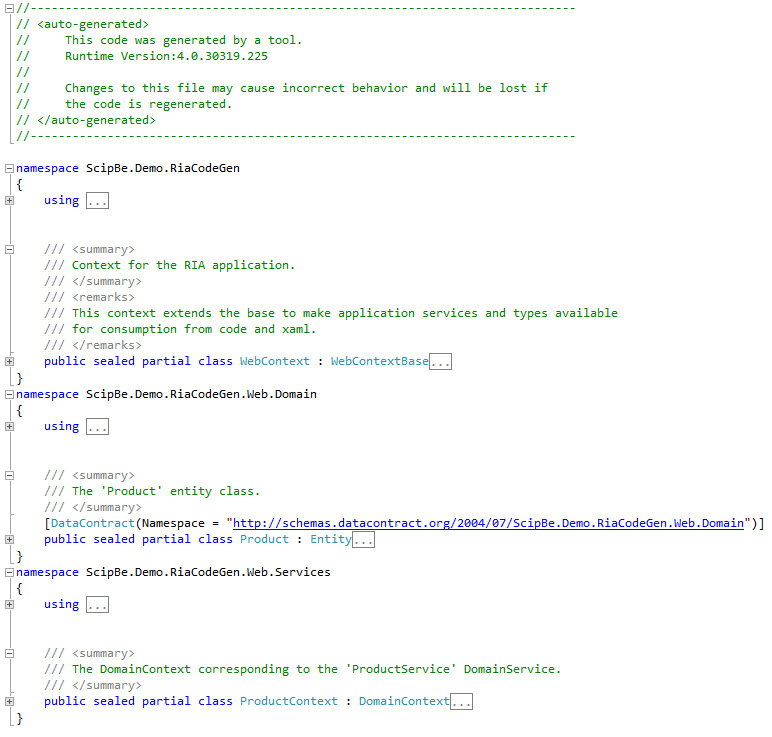 GetClassComments method in the GenerateClassDeclaration method and XmlCommentsProvider. GetPropertyComments in the GenerateProperty method. I always prefer to create derived classes from the .NET classes in my framework so that I have the freedom to add new or modify default behaviour. On server side I always implement my own DomainService class. 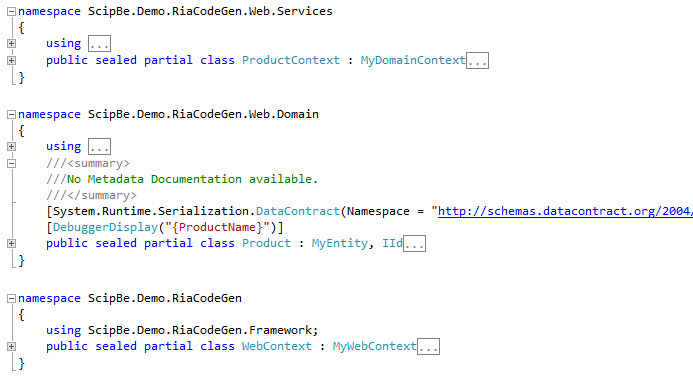 Now we can also implement derived classes on the client for Entity, DomainContext and WebContext. 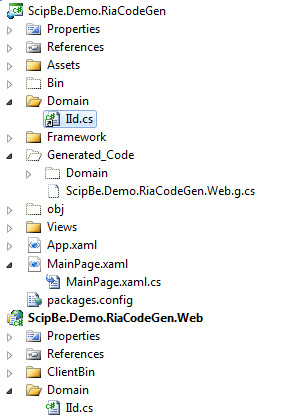 So I added 3 classes MyEntity, MyDomainContext and MyWebContext in a Framework folder in the Silverlight project. The next step is very easy and you just have to replace some text in the TransformText method. This is how my MyEntityGenerator class will look with all the previous examples implemented. The MyDomainContextGenerator and MyWebContextGenerator classes are implemented in the same way. Now you can start to add your own logic in these framework classes. For example you could modify the endpoint timeouts in the MyDomainContext class. It is a lot easier to debug a Silverlight RIA Services application when the timeouts are increased. You could also create your own overloaded Load methods. I don't know if you ever faced the problem of logging out with RIA Services while domain contexts or still loading or submitting data. You will get exceptions. Therefore it would be handy of you could check if domain contexts somewhere in your viewmodels are still processing. In the singleton MyWebContext class I added a 2 static methods to increase and decrease a counter and in the Load method of my MyDomainContext I call this increase method and in the callback action the counter is decreased. Of course you should do the same in the SubmitChanges and the two InvokeOperation methods. Now you can easily check if domain contexts are busy loading or submitting data. I hope that you like my T4 code generation examples for RIA Services and that you can take advantage of it. It is a very powerful feature and I'm quite sure these features will be extended in future versions. If you have any other ideas, remarks or suggestions, please let me know. 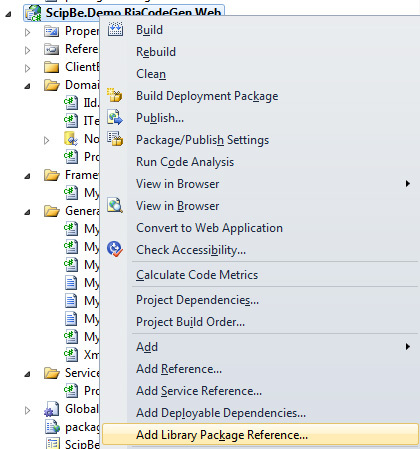 Contents: Demo application how to customize WCF RIA Services code generation.